A deeper look at the grooves pressed into The Flaming Lips’ Greatest Hits Volume 1 LP. As a general rule, I must confess that Best-Of compilations seldom thrill me. While the odd set does prove to be the rule’s exception (like Nirvana’s black album, the set that Morphine released several years ago, ChangesoneBowie, Hot Rocks and All For Nothing/Nothing For All turned out to all be great sets) and which does present the band in question at its best, most best-of comps are characterized by what’s missing from them and are really little more than utilitarian discs which either help to run out a band’s contract or nab a couple of bucks from the pockets of the most “in passing” of fans. Most “real” fans (rightly) seldom look twice at a Greatest Hits comp by virtue of the knowledge that most of what might be on it can already be found in their record collections anyway. Such is absolutely true of the single-disc, vinyl incarnation of The Flaming Lips’ Greatest Hits Volume 1 set as well; but leave it to Wayne Coyne and his crew to take a stale, old idea and make it seem fresh, new and exciting again – in this case by taking the tracks from their catalogue and making them flow in a manner which re-contextualizes them. True, there is precisely nothing on this set that even the most superficial of listeners don’t know, but the manner in which the set is assembled makes the listening experience different and perfectly engrossing, by extension. No matter what any listener might be expecting as they sink a stylus into the A-side of Volume 1, the bells which open “Do You Realize? ?” will shock and hold them dearly with an immediacy that is startling in its own right. There, a contrast of very large sounds and very small ones is instantly struck; the chiming bells and Wayne Coyne’s acoustic guitar while gang vocals nearly clip as they crest in on top of the mix. The “newly remastered for this vinyl release” presentation stands directly between being stunning and senses-shattering, and the results leave even those listeners who presumed they would know what was coming slack-jawed; from note one, they’ll be succored in and dazzled more than anyone who simply assumed that a best-of comp would bear no surprises could possibly expect. Continuing in the direction set by the fact that “Do You Realize? ?” is the opening cut for this compilation, Volume 1 follows with “Yoshimi Battles The Pink Robots” before shifting gears (and album selections) to pay tribute to “Race For The Prize” and then moves backward (in time) to touch on “Waitin’ For A Superman.” Along the way, listeners may find themselves actively trying to STOP the sparks of amazement which flash through their eyes; while no amount of digital editing or retouching has obviously been done to these songs (the exception to that is the version of “The Yeah Yeah Yeah Song (With All Your Power)” which appears at the end of the album’s B-side, but more on that later) – the pristine nature of the sound on this analogue format in addition to the carefully sequenced running proves to be just delightful. In fact, the only real drawback to the order of the selections on this LP is the fact that “She Don’t Use Jelly” is the song which closes the side; taking it as ir is, some listeners may find themselves sighing that the set has acquiesced to convention in that one moment, but they can content themselves with the concession that if the song has to go anywhere (and, being one of The Flaming Lips’ biggest hits to date, it did need to be included), at the A-side’s close is as good a place as any. 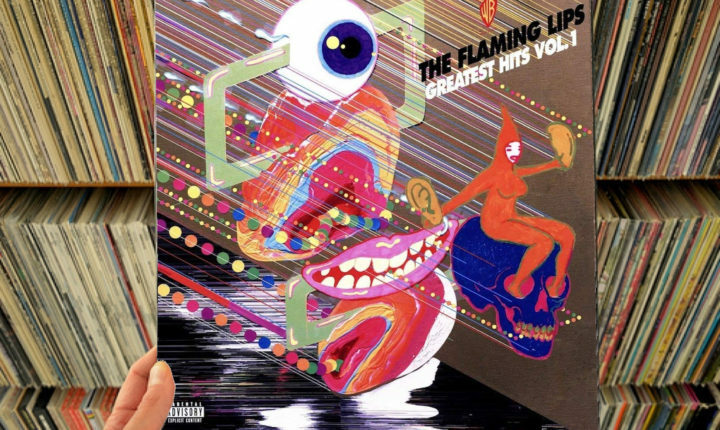 The Flaming Lips’ Greatest Hits Volume 1 LP is out now. Buy it here on Amazon.